Roasted asparagus is one of the easiest, most foolproof recipes. Simply chop the woody ends off washed asparagus spears (about the bottom two inches), spread them on a baking sheet, add a little oil and seasoning, and pop them in the oven. Shake the pan once in a while so they don’t brown on one side, and take them out when they are cooked to your liking. 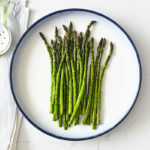 This simple roasted asparagus recipe is a wonderful side dish with just about any meal, even this poached eggs breakfast! Give it a flavor boost by adding chopped garlic before baking, or dress it up just before serving with chopped fresh herbs, a squeeze of lemon juice, a drizzle of balsamic vinegar, or some freshly grated Parmesan cheese. Pro tip: When choosing asparagus, select young asparagus with thin, tender stalks. Thick asparagus tends to have woody texture, but if that’s all you can find, consider peeling it with a vegetable peeler. This easy roasted asparagus recipe is a great side to any meal. Place asparagus on large baking sheet in a single layer. Drizzle with oil. Season with salt and pepper. Bake, shaking pan occasionally, for 22 to 25 minutes, or until tender-crisp. A great veggie for lunch or dinner.